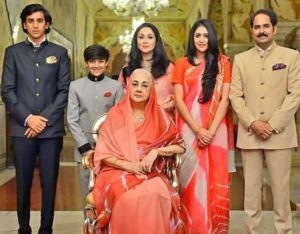 Diya Kumari of the erstwhile Jaipur royal family and her husband Narendra Singh have ended their love marriage after 21 years. The ex-royal couple filed their petition in the first week of December. Accepting the divorce petition on Tuesday, January 15, a family court of Jaipur decreed that the couple legally separated and no longer husband and wife. The petition was filed in the family court (No. 1) at Gandhi Nagar in Jaipur, Rajasthan, a few months ago under Section 13B (divorce by mutual consent) of the Hindu Marriage Act, 1955. The couple had been living separately for some time now. The only daughter of (Late) Bhawani Singh and Padmani Devi, and Former BJP MLA, Diya Kumari 47, fell in love with Narendra Singh, who was from a modest family and married him in 1997 amid controversy. Following her grandmother Maharani Gayatri Devi’s footsteps, Diya Kumari entered the politics in 2013 Rajasthan assembly elections. She won the MLA seat from Sawai Madhopur constituency. Conversely, in assembly election 2018, Diya Kumari stepped back from fighting elections reasoning personal choice. Kumari’s decision to marry Narendra Singh had made other erstwhile royals and the Rajput community unhappy and furious because the two belonged to the same ‘gotra’. Diya Kumari and Narendra Singh dated for nine years before getting married. The couple tied the knot in August 1997 in a hush-hush affair in New Delhi following a widespread protest by the Rajput community. The ex-couple have two sons and a daughter. The court gives the custody of sons and daughter to Diya Kumari. Eldest son Padmanabh Singh is already crowned as Maharaja of Jaipur years back.